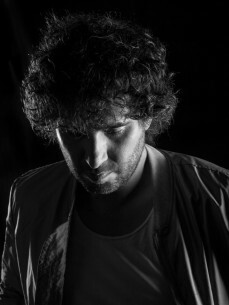 Mathew Jonson really is one of a kind. He's developed one of the most distinctive voices in electronic dance music: when you hear one of Jonson's tracks, you almost immediately know it's his. And yet there's no mistaking any given track for another. His standards for sound and presentation are exacting. Both on stage and in the studio, Jonson's fealty to analog equipment and real-time play—as opposed to mere playback—serves as a standardbearer for a kind of electronic music that goes way beyond the drag 'n' drop world of digital composition. Jonson has always been eager to get his hands dirty, and the music reflects that in gnarled bass sequences and long, intuitive lines. His sounds have serious teeth. And despite his quick ascent through the ranks of the techno elite, Jonson hasn't just stayed personally grounded. He's devoted much of his energy to supporting his own close musical family, both in the groups Cobblestone Jazz and the Modern Deep Left Quartet, and with his Wagon Repair label, which he cofounded with Jesse Fisk, Graham and Adam Boothby, Frank Meyerhofer and Konrad Black. He studied classical piano as a kid, plus jazz drumming, and played drums in a marching band —thus laying both the melodic and the rhythmic cornerstones of his music today. (Plenty of musicians claim to be "classically trained," of course, rendering the phrase all but meaningless. But here's something you might not have known about Mathew: he's actually begun studying piano again, which suggests a musical seriousness that's rare in the world of auto-didact button-pushers. Thanks to his father's work with sound technology, he also got his hands on synthesizers at the age of 9. By the time he discovered hip-hop as a young teen, he was recreating its electro-based beats on his own rudimentary setup at home. "It was all improvised," says Jonson of the group's early days. "We never really worked in the studio, we would just meet at the nightclub and jam. That's how it started. We did that for quite a while, and then it morphed into a residency at a club, once every two weeks." To keep it interesting, they would invite other musicians—on trumpet, violin, bass, sax, and rhythm sections—to join them. After de la Plante left town, Cobblestone Jazz began focusing its efforts more squarely on the dancefloor, moving away from purely improvised sets to include composed and rehearsed passages. And Jonson gradually began honing in on his own sound, both in his productions and his DJ sets, inspired by a deeper, weirder sound that had begun filtering into the city's techno parties. His first record, in 2001, was the first release on the B.C. label Itiswhatitis, appropritately titled "New Identity." Another followed in 2002, and in 2003. That year, he also made his first appearance on Perlon, "Alpine Rocket"—a track he recorded alongside Luciano during his first trip to Europe. And then, suddenly, Jonson was everywhere: Itiswhatitis, Sub Static, Arbutus, Kompakt, M_nus—and every track an anthem. "I had all that music kind of saved up," says Jonson, "and then, just by chance, released it all at the same time. People criticized me for it, said that it wasn't a good idea. But it worked out for me. All the tracks did well. I wasn't saturating the market with bad music." He's right there. In 2005, Jonson co-founded Wagon Repair, and it's been a blur since, a nonstop series of tours and recordings, solo and with his bandmates. Crucially, he moved to Berlin. Here, he and de la Plante—who moved over at the same time—have set up Cobblestone Jazz' European headquarters, providing not only the launch pad for European tours but, more importantly, the control center for the group's recorded activities. The studio is jawdropping, frankly: a semi-circle full of gear, from old workhorses like the 808 and 909 and SH-101 to unique beasts like their Cwejman and Roland System 100m modular system. Tate's Rhodes piano anchors one corner of the horseshoe, and everything feeds into a massive desk where tracks are mixed and recorded in real-time. Jonson makes his own music essentially the same way—only with two hands instead of eight. Those two hands have come up with some remarkable material. Having perfected his brand of earthshaking epic with tracks like "Marionette," "Return of the Zombie Bikers" and "Symphony for the Apocalypse," Jonson has increasingly turned his efforts towards more personal, introspective music. He hasn't left the clubs behind—his new album, Agents of Time, features a number of tracks that are as hip-windingy wily as anything he's produced yet, full-on tracks like "Girls Got Rhythm" and "Thieves in Digital Land." But he's also taken advantage of the longplayer format to stretch out and indulge darker moods and slower tempos. "I like to have phrases that sound like they're major, but then they go minor when they turn around," explains Jonson. "You think that you're in a happy place, but suddenly you're not. I like playing with that tension. When I look at the music I've made, the best music is always music that can stimulate any kind of emotion. It's more like a key, towards opening up whatever is inside of you -a gateway"
You can expect him to be unlocking even more emotions soon—ones you may not have even known you had—when he ramps up with Midnight Operator, a collaboration with his brother Nathan Jonson, aka Hrdvsion. With Nathan also based in Berlin, the two are finding common musical ground, expanding upon the platform they established with their lone, 2007 EP for Wagon Repair as they begin work on an album.